It is a peaceful countryside with scarecrows made of pre-conversion Cybermen. (The patients in the hospital from “World Enough and Time”.) A big house is full of playful children. The sky has 507 written on it, giving away that we are still on the gigantic colony ship from the last episode. The kids are roughhousing in their large room when an alarm bell starts to ring. The woman who is in charge, Hazran (Samantha Spiro) tells them to get under their beds. Hazran and the other adults shoot the approaching pre-conversion Cybermen. The next morning they hang up the pre-conversion Cybermen they shot the previous evening as scarecrows. A little girl named Alit (Briana Shann) skips along the field. Thunder rumbles and the ground opens; a shuttlecraft emerges and flies up to the sky and then crashes. Out of the smoke, a Mondasian Cyberman carries the unconscious Doctor (Peter Capaldi). An alarm goes off and they realize the Cybermen are after them. Missy and the Master are confused. The Doctor explains that when Missy hit him, it allowed him to get to the keyboard. He expanded the definition of being human to having two hearts. The Doctor tells Missy, “Welcome to the menu.” The Master and Missy try to fight off the Cybermen by themselves. The Doctor offers to help but the Master would rather die than accept the Doctor’s help. Missy knocks out the Master and sets the Doctor free. He talks into his sonic; Nardole had slipped off to retrieve a shuttlecraft. A Cyberman electrocutes the Doctor. Before Missy can shoot it, Cyber-Bill shoots it with the blaster on top of her head. Missy thinks the Doctor could be dead, so she leaves him. Both the Master and Missy tell Nardole that the Doctor is dead and he told them that he hated Nardole. They order Nardole to leave, he won’t and he points out why they can’t. Cyber-Bill is holding the rope ladder to the shuttlecraft preventing them from flying. Back to the present, Cyber-Bill is carrying the Doctor. Missy and the Master come up from behind them. Alit asks who are they. Nardole tells her they have come from downstairs and they need her help. Bill is in the barn, looking like herself. Hazran goes to the barn to check on her. She is noticeably nervous. Bill doesn’t remember where she is. The Doctor told Hazran that Bill is harmless, so she apologizes that Bill has to stay in the barn, but she scares the children. Bill asks where the Doctor is, Hazran tells her they are tending his injuries. Hazran leaves a confused Bill. Alit enters the barn and tells Bill everyone is scared to talk to her, but she isn’t. Bill asks her why. Meanwhile, Nardole is supervising the villagers in building defenses for an impending Cybermen invasion. Alit brings Bill a mirror, and she sees that the reflection in the mirror is a Cyberman. Bill can’t believe it and keeps saying in a robotic voice, “I am Bill Potts.” A frightened Alit runs into the Doctor. He says to Bill, “Hello Bill Potts.” Alit apologizes for giving Bill a mirror, but the Doctor tells her not to apologize, she did it to be kind. Alit leaves the Doctor and Cyber-Bill alone. She asks the Doctor why she saw a Cyberman in the mirror. Bill’s memory is hazy. She remembers waiting for the Doctor for ten years. She doesn’t remember the conversion. She sees glimpses of her true self, like her shadow, or seeing her bandaged hand. The Doctor: “You are so strong. You’re amazing. Your mind has rebelled against the programming… All that time living amongst the Monks, you learned to hang on to yourself.” He tells Bill that her mind is like a perception filter. She still sees herself as she used to be. Bill becomes angry and he tells her she doesn’t have the luxury of being angry ever again. She asks why and the Doctor tells her she is a Cyberman. She blows a hole through the barn. The villagers look upon her with fear. Bill cries and says that they will always fear her. The Doctor remains silent but he removes a tear from Cyber-Bill. Bill asks if it is motor fuel, the Doctor says it is an actual tear. The Master walks up. He changes into his Razor persona to torture Bill. He tells her how boring she was but turning her into a Cyberman was worth it. The Master tells her he’ll be a woman soon, as a former woman, does she have some tips, or old bras. Cyber-Bill tells him she isn’t upset. The Master leaves since it isn’t any fun if she won’t bite. We see Bill cry. The Doctor, Cyber-Bill, and the Master approach Missy, she asks why they brought ‘her’. The Master chastises her for referring to Cyber-Bill as a she and not an ‘it’. While working on the elevator, Missy tells the Master, the reason they can’t remember any of this is that they have crossed each other’s timeline. The Doctor tells them they need to find more elevators to evacuate the villagers before Operation Exodus takes effect. Missy brings up an elevator. The Doctor scolds her because she could be bringing up Cybermen from the bottom floors. Cyber-Bill tells them to stand aside. The Master grumbles about Bill ordering him around. 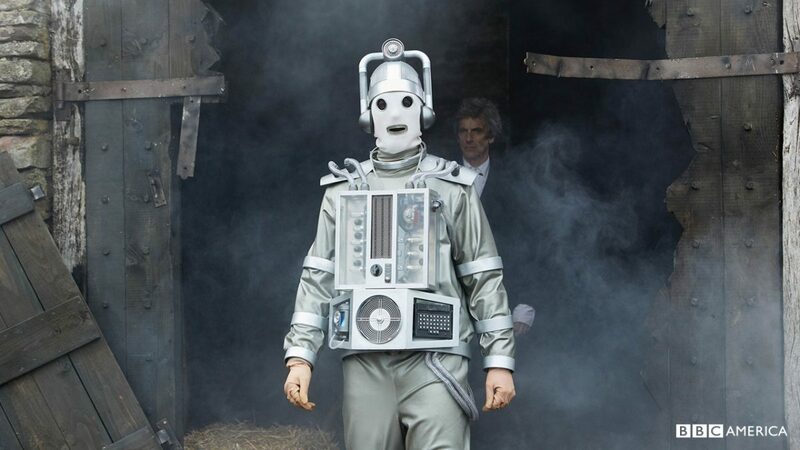 The Master: “Is the future going to be all girl?” The Doctor: “We can only hope.” A modern day Cyberman steps out. The Doctor, Missy, the Master and Cyber-Bill shoot it. They hurry back to the farm. The villagers can hear horns and drums. The Cybermen might not feel fear but they know how to cause it in others. Nardole appears to make the villagers weapons much stronger with his computer. They can make the Cybermen think they have powerful weapons. Missy and the Master are trying to figure out a way to get to their TARDIS and escape. The Master screwed up his ship and blew up his dematerialization circuit. Missy: “Which reminds me, a funny thing happened to me once.” The Master: “What?” Missy [throws the Master up against the wall]: “A very long time ago, a very scary lady threw me against a wall and made me promise to always, always carry a spare dematerialization circuit! I don’t remember much about her now [pulls out a dematerialization circuit] but she must have made quite an impression.” The modern Cybermen along with the Mondasian Cybermen take off from their city, heading upwards to the farm. The Doctor sits on the porch with a gun. Hazran is making the moves on Nardole when Cyber-Bill walks in. Hazran is startled and shoots Cyber-Bill. Cyber-Bill sadly understands. The Cybermen arrive. The Doctor figures they have ten minutes before they attack. The Doctor gives Alit an apple to use as a weapon. Missy and the Master tell the Doctor they are leaving; they mock him for staying to fight when he doesn’t have a chance to win. The Doctor stops them to tell them why he is doing this. The Doctor: “I’m not trying to win. I’m not doing this because I want to beat someone, because I hate someone, or because I want to blame someone. It’s not because it’s fun. God knows it’s not because it’s easy. It’s not even because it works because it hardly ever does. I do what I do because it’s right! Because it’s decent! And above all, it’s kind! It’s just that… Just kind. If I run away today, good people will die. If I stand and fight, some of them might live. Maybe not many, maybe not for long. Hey, you know, maybe there’s no point to any of this at all. But it’s the best I can do. So I’m going to do it. And I’m going to stand here doing it until it kills me. And you’re going to die too! Someday… And how will that be? Have you thought about it? What would you die for? Who I am is where I stand. Where I stand is where I fall.” The Doctor ask them to stand with him. The Master: “See this face? Take a good long look. Because this is the face that didn’t listen to a word you just said.” He turns to Missy and tells her she’s changed, and begs her to stand with him. Missy hesitates but says no, she thanks him for trying. Missy wants to hug the Master. The Master is thinking it will be more than a hug. Missy: “I loved being you. Every second of it. Oh, the way you burned like a sun, like a whole screaming world on fire. I remember that feeling. And I always will. And I will always miss it.” Missy stabs the Master in the back. She takes the Master to the elevator so that he can regenerate and become her. The Master asks what she is doing. Missy is going back to help the Doctor fight the Cybermen. Missy: “It’s time to stand with the Doctor.” The Master says he’ll never stand with the Doctor and shoots her in the back, with a blast powerful enough to keep her from regenerating. They laugh as they realize this is their perfect ending, stabbing each other in the back. The Master’s elevator heads down, while Missy lays in the field peacefully. On Floor 507, only one Cyberman is walking amongst the desolation, Cyber-Bill. Bill finds the Doctor and cries over his body. A short distance from her, a pool of water appears. Out of the pool emerges Heather (Stephanie Hyam), Bill’s crush from “The Pilot”. Bill’s Cyberman body falls and Bill is free from it. She asks Heather if she is dead, Heather kisses her and asks does it feel like she is dead. Bill is like Heather now. Heather was able to track Bill through the tear she shed. They take the Doctor back to the TARDIS for his final resting place. Heather is able to pilot the TARDIS off the colony ship. Of course, the TARDIS is going to take the Doctor where he needs to go. (To the planet we saw at the beginning of “World Enough and Time”) Bill: “You know what old man? I’m never gonna believe you’re really dead. One day everyone is going to need you too much. Until then.” Bill kisses him on the cheek. “It’s a big universe, I’ll see you again.” Her tears fall on him. “Wherever there are tears, there is hope.” Heather can make Bill human again, but she’d like to show her the universe. Bill has been through a lot since they last saw each other, and she would like to show Heather around. The two women leave for their adventures. The Doctor is in another hopeless situation, maybe the most hopeless situation since the show started again in 2005. Bill is a Cyberman. He has to save a community of human against an army of Cybermen. His two worst enemies, the Master and Missy are with him. He has begun the regeneration process, and he can’t get to the TARDIS. It is in this moment we see the true character of this Doctor. Simply put, the twelfth Doctor is kind. He knows the situation is hopeless, but he has to help these people, not because he thinks he’ll win, or he wants to beat someone, not because it is fun, or that it is easy. He does what he does because it is the kind thing to do. When we met twelve, he could barely stand people. He wondered if he was a ‘good man’. He eventually decided he was an idiot in a box, going around trying to do good. The Doctor continued to grow, until on this colony spaceship, he will make his final stand for kindness. If we could all be like the Doctor. The episode had so much happening. The previous episode ended in a sad dark place. This week’s episode ended in a bittersweet place. Missy finally decided to stand with the Doctor, but the Doctor would never know this because the Master killed her before she could join him. Heather saved Bill from being a Cyberman, but the Doctor doesn’t know this. The Doctor is alive, but Bill doesn’t now that. Nardole has no idea what has happened to his friends, he can only guess both are dead. At least we know things worked out okay, but our characters don’t. Maybe they will find out some of this during the Christmas special. “World Enough and Time” and “The Doctor Falls” is the best season finale for the twelfth Doctor. Both episodes were of equal quality and only enhanced the quality of the entire season. There was plenty of action with the final showdown between the Doctor and the Cybermen. I liked that even though they had evolved to the modern day Cybermen, they still had the Mondasian Cybermen in their army. The Mondasian Cybermen are my favorite Cybermen. The episode was very touching. The scene with Nardole trying to say goodbye to the Doctor and Bill could even melt a Cyberman heart, if they had one. Matt Lucas, Pearl Mackie and Peter Capaldi were great in the scene. Bill saying goodbye to the Doctor on the TARDIS was heart rendering. I’m going to miss Pearl Mackie on this show. She brought so much life back into the show. I’d like to see her on the show next season, but she was so good with Capaldi, that I can accept her moving on. 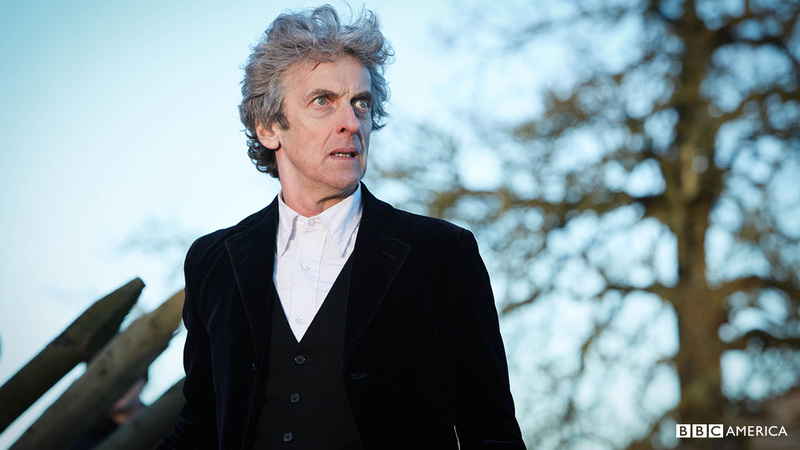 I was excited when they announced Capaldi as the Doctor. His first season gave me some doubts; they didn’t nail down his character at first. By his second season, he was great, and this season, he surpassed my fondest hopes of him being the Doctor. He is my favorite Doctor now. This was an excellent season. The addition of Mackie and Lucas was brilliant. Having Michelle Gomez back and with a bigger part was even better. She really made Missy a more complex character. The writing was consistently good this season. There weren’t any episodes I hated, like in past seasons. The Monk trilogy was a little disappointing; it started so well but seemed to peter out. These final two episodes made up for it. It’s good to know Capaldi got to leave out on a high. I hope the Christmas special meets the standards this season established.